action and maintains low leakage rates. To prevent damage in case of clogging, a safety device stops the unit. 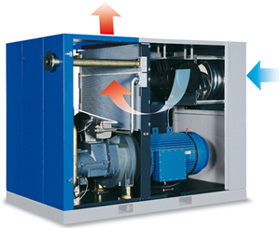 The DRF range is fitted with speed regulated EC (Electronic Commutation) turbines. 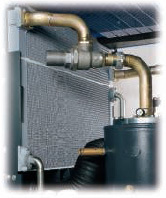 The speed is automatically regulated to the cooling requirements of the machine. Low noise level compared to a conventional fan. 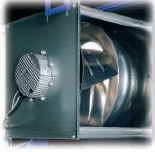 Increased energy savings, as the turbine is speed regulated to the cooling requirement. ensuring a constant temperature and reduced maintenance. exceeds 10°C above ambient in maximum conditions. - Vertically mounted for easy maintenance. - Efficient, three-stage air/oil separation, (centrifugal/gravitational/ coalescent). - Durability, reduced pressure drop, and leak free.